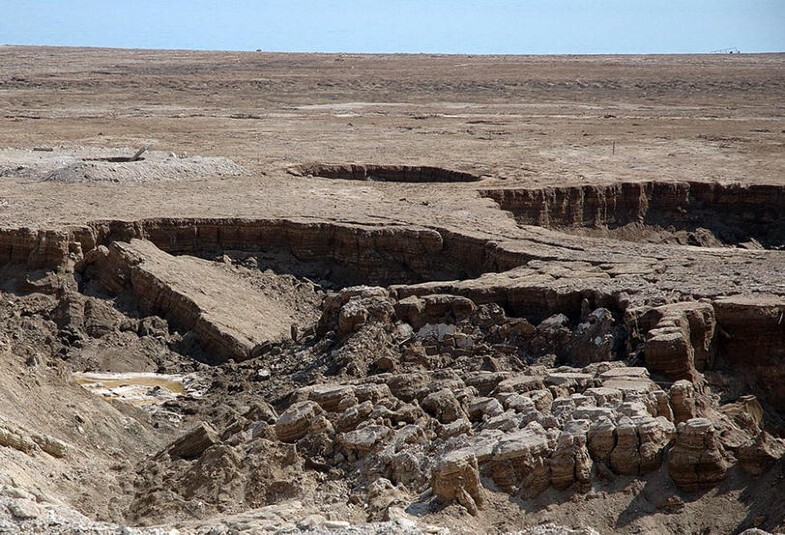 A subrosion pipe or sinkhole is a geologic phenomenon that occurs due to dissolution of strata in the subsurface causing the overlying sediments to collapse. The subrosion pipe in the Winterswijk quarry complex in the eastern Netherlands yielded rare, dark-colored shales. Bivalves and palynomorphs indicate that the shales were deposited during the Rhaetian (uppermost Triassic). In addition, detailed correlation with other NW European localities in Great Britain, Austria, and Germany further constrained the age of the shales to the middle of the Rhaetian. The shales were deposited in a near-coastal environment and contained a low diverse macroinvertebrate fauna with bivalves and some brittle stars that lived in a hostile environment, probably caused by low salinity and oxygen levels. These middle Rhaetian shales were mixed with dark-colored middle to late Hettangian sediments, both overlying Middle Triassic (Anisian) strata, which is present in the pipe as well. The presence of Rhaetian sediments in the subrosion pipe reopened the discussion on its age of formation. We suggest that a collapse in the Middle Eocene is most likely. This research expands the knowledge of the marine realms in the uppermost Triassic in Europe, just prior to the Permian–Triassic extinction event. Rhaetian sediments have been found in many NW European countries including Great Britain, Austria, Germany and the Netherlands. Dutch Rhaetian sediments are scarce in the subsurface and even rarer at the outcrop. ‘Landmark 94’ (Herngreen and De Boer 1974) is an outcrop close to the German border. The only other two outcrops have been found in the Winterswijk quarry complex in a subrosion pipe in Quarry III and in the northernmost part of Quarry IV (Figs. 1, 2). Dutch Rhaetian sediments are assigned to the Sleen Formation, the lowermost unit of the Altena Group (Van Adrichem-Boogaert and Kouwe 1993–1997). Past research on these shales at Winterswijk is limited. Herngreen et al. (2000b, 2005a, b) primarily reported on the palynomorphs of the shale at Quarry IV. Lissenberg (1989) proposed a preliminary Hettangian/Sinemurian age for the shales in the subrosion pipe (Quarry III) based on micropaleontological evidence (ostracods, foraminifers, and holothurians), while Herngreen (1989) suggested a late Hettangian age as based on sporomorphs. Herngreen et al. (2005a, b) mentioned the occurrence of the subrosion pipe. Oosterink et al. (2005, 2006) first described the pipe and referred to the shale as Rhaetian/Lower Jurassic based on the references mentioned above and rather ambiguous red spots which would be indicative of the Rhaetian (Gerth 1955). Subsequently, Klompmaker and Van den Berkmortel (2007) reported on middle to late Hettangian ammonites that were intermixed with the shales. They noted that part of the shale might be Rhaetian in age based on the presence of disarticulated fish remains, bivalves, and possible parts of a pyrite layer in the subrosion pipe and in the Rhaetian shales of Quarry IV. Thuy et al. (2008) recorded Rhaetian brittle stars from shales of the pipe. The Rhaetian sediments from the pipe have been removed and only a few samples could be saved for this study. The term subrosion refers to subsurface erosion due to the solution of salt(s) and/or gypsum/anhydrite followed by subsequent adjustment and/or collapse of overlying strata resulting in a so-called subrosion pipe or sinkhole. This happens today in the areas bordering the Dead Sea in Israel (Fig. 3), which is drying up. The subrosion pipe at the Winterswijk quarry complex (Fig. 1) could be caused by dissolution of evaporite deposits of the Zechstein or Röt. Oosterink et al. (2006) suggested that dissolution of the latter and subsequent collapse of the overlying strata most likely caused the subrosion pipe to form. Collapse of strata due to dissolution of salts in the underlying Zechstein Group (Permian), the top of which is at much greater depths between 500 and 800 m east of Winterswijk, was considered to be less plausible. Oosterink et al. (2006) hypothesized that the pipe formed well after the Oligocene, but prior to the Quaternary. The purpose of this study is to investigate the Rhaetian strata from the subrosion pipe in detail, to describe the stratigraphy from the subrosion pipe, and to readdress its age of formation. 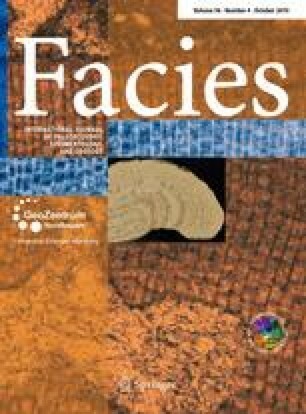 In addition, the presence of (micro)fossils found within the Rhaetian shales provides the opportunity to determine the precise age by means of correlation to other NW European localities. These fossils also allow a reconstruction of the paleoenvironment in which the shales were deposited. This study significantly contributes to the knowledge of the marine Rhaetian in NW Europe on the brink of the Permian–Triassic extinction event. The following compilation of the regional geology of the Netherlands is based on papers by Herngreen and Wong (2007, 2008) and in more detail for the Achterhoek area in the eastern Netherlands based on NITG-TNO (1998) and Herngreen et al. (2000b). During the Late Permian and Jurassic, the structural outline of the Netherlands progressively changed from one single, extensive basin into a pattern of smaller, fault-bounded basins and highs. The remarkable differences in sedimentary development of the various basins around the Jurassic/Cretaceous boundary can be understood in the context of tectonic events in the Northwest European Basin. This change is associated with the disintegration of Pangea (Ziegler 1990). It occurred in extensional phases of which the Early Kimmerian Phase (Late Triassic), the Middle Kimmerian Phase (Middle Jurassic) and the Late Kimmerian Phase (Kimmeridgian–Valanginian) are important for the present study. Rift structures such as the Central Netherlands Basin and Lower Saxony Basin originated during this period or constitute rejuvenated Paleozoic elements. In the Early Cretaceous, thermal subsidence became important, and transgression gradually took place. This flooding was briefly interrupted by the Early Albian Austrian tectonic phase and followed by the widely recognized Albian transgression. During Late Cretaceous times, the influx of clastics decreased due to the submergence of nearby source areas, and calcareous sedimentation increased. The Subhercynian (Santonian–Campanian) and Laramide (Paleocene) tectonic phases caused strong differential subsidence and tectonic inversion of former Jurassic basins. In the Winterswijk area, the Late Permian lithostratigraphic units are assigned to the Rotliegend Group, comprising mainly sandstones and conglomerates, and the overlying Zechstein Group, which comprises several evaporite cycles with rock salt and carbonate anhydrites and sabkha-mudflat deposits. The sedimentary development of the Lower Germanic Trias Group with Bunter Sandstone and Shale and subordinate Röt rock salt formation in the lower part of the overlying Upper Germanic Trias Group is very similar to the Permian. A distinct marine influence is present in the Muschelkalk Formation with marls, limestone, and dolomite. Younger strata of the Upper Germanic Trias Group include the claystones of the Keuper Formation. However, this formation is absent in the Winterswijk area, due to the Early Kimmerian tectonic phase followed by subsequent erosion. The Jurassic sedimentary cycle, characterized by marine shales and sandstones, already starts with the latest Triassic Rhaetian Sleen Formation. This is the lowest formation out of the five that constitute the Altena Group and extend up into the Callovian (latest Middle Jurassic). Upper Jurassic strata are essentially unknown from the area under consideration due to the Late Kimmerian tectonic phase. The Lower Cretaceous is incomplete with terrestrial and marginal marine sandstones and claystones of the Kuhfeld Schichten (Valanginian–Hauterivian; not assigned to a formal lithostratigraphic unit), and the fully marine Holland Formation (Aptian–Albian). Here, the last unit consists of the Holland Greensand Member (Aptian) and the Upper Holland Marl Member (Albian). This development demonstrates an increasing marine influence which continues in the Cenomanian Texel Formation (Chalk Group) with predominantly marls. Younger Cretaceous strata, which are well developed elsewhere in the Netherlands and adjacent parts of the continental shelf in the Ommelanden Formation, have so far not been found. The Tertiary is mainly represented by glauconitic and/or calcareous clays and fine-grained (glauconitic) sandstones of Late Paleocene, Eocene, Oligocene, and Miocene age. Hiatuses, sometimes small in scale, and slight unconformities indicate movements during the (Early) Tertiary, some of which can be attributed to the Pyrenean tectonic phase. The bivalves, palynomorphs, and sediments were used to determine the age of the shales in the subrosion pipe, and for correlation with Great Britain, Austria, and Germany. In addition, the paleoenvironment in which the shales were deposited was addressed and the age of the subrosion pipe was discussed. More than 7,700 bivalves were collected from the shales of the lowermost decimeters of the subrosion pipe in 2006 and 2007 (not from the already recognized lighter-colored Hettangian clays). At that time, most of the 2 m mentioned by Oosterink et al. (2005, 2006) were already removed (GFWH remembers about 4 m). In addition, 689 bivalves were collected from the Rhaetian shales at Quarry IV (2007 and 2008). All bivalves with more than half of the shell preserved were counted individually. Valves were counted as one. Bivalves were identified to genus or species level, whenever possible. The bivalves are stored in the Nationaal Natuurhistorisch Museum Naturalis, Leiden, the Netherlands (RGM numbers). Sample processing was carried out on two samples (A and B) from the shales of the lower two decimeters from the subrosion pipe according to TNO-standard procedures for pre-Quaternary palynology (Janssen and Dammers 2008). Chemical treatment included adding cold HCl 30%, twice cold HF 30–40%, and again cold HCl 30%. Finally, the residue was sieved with nylon sieves of 18 and 250 μm to concentrate the organic material. Heavy-liquid separation, usually using a bromoform-alcohol mixture or sodium polytungstate of specific gravity 2.1, was not applied. After counting some lines of the strew slides, the remaining parts were thoroughly scanned for special taxa. The slides are stored at TNO, Utrecht, The Netherlands. The three dominant species, Isocyprina sp., Tutcheria cloacina, and Rhaetavicula contorta, comprise >95% of the bivalve fauna (Figs. 4, 5; Table 1). Isocyprina sp. is the most abundant bivalve found in the Dutch Rhaetian sediments, which is the same for Great Britain (Moore 1861). Tutcheria cloacina and Pteromya sp. were articulated in more than 10% of the cases. The total number of right valves from R. contorta is far greater than the number of left valves. This is probably due to the fact that the right shell is more robust. A similar result has been found for this species in Great Britain (Ivimey–Cook et al. 1999). Other than the presence of Rhaetavicula contorta in shales from borehole ‘Ratum’ (Herngreen and De Boer 1974), Rhaetian bivalves were not known from the Netherlands. The actual shell material was dissolved; the bivalves were primarily preserved as moulds. Some shells showed replacement (e.g., the pyrite layer replaced the carbonate shell, sometimes accompanied by cubic pyrite crystals). The pyrite might have formed due to the former presence of organic matter inside the shell (Ivimey–Cook et al. 1999). Table 2 gives the complete results of the palynomorphs, and Fig. 6 shows the most important palynomorphs found in the shales of the subrosion pipe. The palynodebris of both slides shows much structureless organic matter (SOM); almost all plant fragments (wood and leaves) are converted into indeterminable macerals, subordinate, approximately 10%, maceral type P4 (Whitaker 1984) occurs of dark brown to opaque, usually blade-like components. Regularly, the sporomorphs (pollen grains and spores) are also affected and specific determination becomes difficult or even impossible. This is exemplified in the Circumpolles-formgroup (of cheirolepidacean conifer origin) which includes here in alphabetic order Circulina meyeriana, Classopollis spp., and Corollina zwolinskae. There is a predominance, 50–60%, of representatives of the Circumpolles-formgroup, species of which the parent plant ecology is comparable to that of elements of the Tertiary and recent mangrove forests. The bivalve Rhaetavicula contorta is an index species for the Rhaetian. To confirm the Rhaetian age of the subrosion pipe shales, bivalves from the shales from Quarry IV were determined to species level if possible (Table 3) because Herngreen et al. (2005a, b) suggested a Rhaetian age for the shales of Quarry IV based on palynomorphs. All common species found in the subrosion pipe shales were found in the Quarry IV shales as well. These two arguments, one from literature and one from comparison to Quarry IV, strongly suggest that the shales from the subrosion pipe are Rhaetian in age. This result is corroborated by palynomorphs from the subrosion pipe. 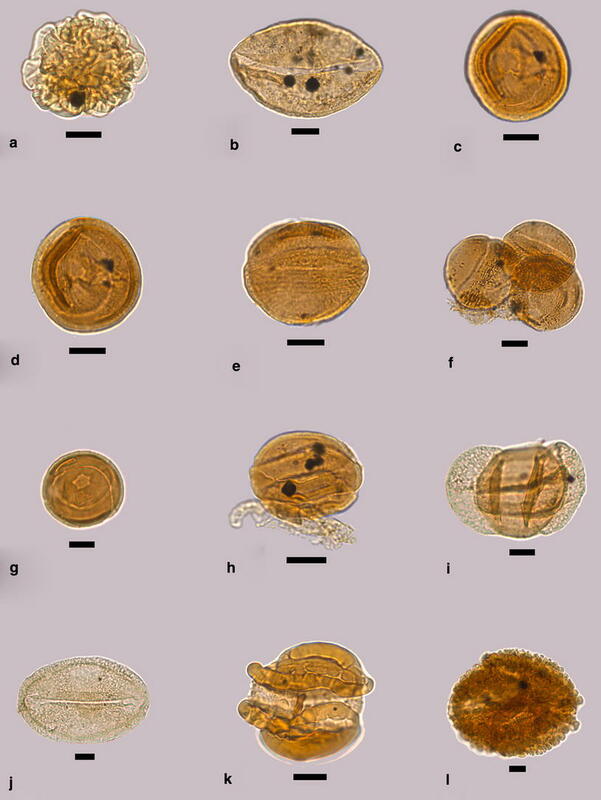 The simultaneous occurrence of Cerebropollenites pseudomassulae, Lunatisporites rhaeticus, Ovalipollis pseudoalatus, Rhaetipollis germanicus, and Riccisporites tuberculatus points to an assemblage that is Rhaetian in age. In more detail, an early to middle, probably middle Rhaetian age, is likely because of the presence of Corollina zwolinskae, Granuloperculatipollis rudis, and rare Heliosporites altmarkensis, and the absence of Cornutisporites spp., Limbosporites lundbladii, Perinosporites thuringiacus, Semiretisporis spp., Triancoraesporites spp., and Zebrasporites spp., taxa which are rare in the middle Rhaetian but become fair or common in the upper Rhaetian. To investigate if both Rhaetian outcrops at Winterswijk are of the same age, sediments of both quarries and their contents have been studied in detail. Since the Rhaetian sediments are only 270 m apart, it could be assumed that if the sediments are of exactly the same age, the fossil content and sediment would be similar. Figure 7 provides an overview of the litho- and biostratigraphy of the exposed part of the Rhaetian sediments at Quarry IV. The clastic sediments of the subrosion pipe are uniformly grey, usually relatively hard and break along the bedding plane in layers with a thickness of millimeters to centimeters. Remains of a pyrite layer were found, as already mentioned by Klompmaker and Van den Berkmortel (2007). The pyrite layer has a maximum thickness up to 1 cm and contains disarticulated fish remains. The Rhaetian sediments of Quarry IV can be divided into three lithological units. The stratigraphic uppermost unit at 0–70 cm below the Rhaetian/Oligocene contact was grey to slightly blue, softer and prone to break down into thin layers of a millimeter or less. Also, a thin pyrite layer of <1 cm in thickness was found 35 cm below the Rhaetian/Oligocene contact (see Fig. 7). The shales were lighter in color, slightly brown, soft, and less prone to break into layers from 70 to 170 cm compared to the topmost 70 cm. Sediments from 170 to 230 cm were similar in color to the topmost part, but less fissile, which is comparable to the Rhaetian shales from the subrosion pipe. Other, loose remains of a thicker pyrite layer containing bones were found shortly after the exposure of the Rhaetian sediments at Quarry IV in 2004, which probably originated from a depth of 240 cm below the sharp Rhaetian/Oligocene contact. This layer was found using a drill that was unable to penetrate a presumably several-centimeters-thick, pyritized layer. Remains of this layer contained disarticulated fish remains. It is unknown if this pyrite layer is the same as the one from the subrosion pipe. Thus, the sediments could not be used to correlate the two Rhaetian outcrops. Most Rhaetian bivalve species from Quarry IV were also present in the subrosion pipe. Moreover, the three most common bivalve taxa of the subrosion pipe are also the most common at Quarry IV. Detailed quantitative comparison is not considered to be useful here because percentages of species of the bivalve fauna do fluctuate throughout the lithology at Quarry IV (see Fig. 7). Isocyprina sp. was not present below 170 cm from the Rhaetian/Oligocene contact at Quarry IV. On the other hand, Tutcheria cloacina was more abundant below this level, while Pteromya sp. was present below 170 cm. The three species were all found in the subrosion pipe. The shales of the subrosion could be best correlated to the shales at a depth around 170 below the Rhaetian/Oligocene contact at Quarry IV, although local variation in the presence of bivalves may have occurred. Sediments of Rhaetian age in the Netherlands are assigned to the Sleen Formation, the lowermost unit of the Altena Group (Van Adrichem–Boogaert and Kouwe 1993–1997). The upper part of this formation, which is of late Rhaetian age, shows invariably rich and well-preserved sporomorph assemblages (e.g., Herngreen and De Boer 1974). This is indicative of bottoms with a normal oxygen content, as is demonstrated in the nearby wells ‘Ratum 41F-129’ (Rijks Geologische Dienst/Geological Survey of the Netherlands Report 2297, 1995) and ‘Sikkink 41E’ (Rijks Geologische Dienst/Geological Survey of the Netherlands Report 2149, 1980), deep corehole ‘Ratum’ (Herngreen and De Boer 1974), the exposure at ‘Landmark 94’ (Herngreen and De Boer 1974) and in Quarry IV (Herngreen et al. 2005a, b). A conversion of the palynomacerals into structureless organic matter (SOM) as seen in both slides from the subrosion pipe is also well known from the Posidonia Shale Formation, Toarcian (the most important source rock of the Dutch oil), and the overlying lowermost Dogger sediments in the eastern Achterhoek (Herngreen et al. 2000b), from the Kimmeridge Clay Formation (Upper Kimmeridgian part), and in particular from the Clay Deep Member in the Central North Sea Graben (Herngreen et al. 2000a). This massive occurrence of SOM is possibly related to the ‘Early Jurassic’ transgression, the first sedimentation cycle after the Triassic, which already starts in the Rhaetian. It is suggested that depressions originated by the Early Kimmerian tectonic phase were subsequently filled in with marginally marine Rhaetian sediments. They were possibly deposited in an isolated position such as temporary closed lagoons. The remarkable difference in preservation (massive occurrence of SOM in shales of the subrosion pipe, but no SOM in Rhaetian shales of Quarry IV) and the far more frequently occurring Rhaetipollis germanicus and Riccisporites tuberculatus in Quarry IV compared to the subrosion pipe suggest that both Rhaetian sediments have not been deposited contemporaneously, although some minor local variations might have occurred (strong stratification, lagoonal settings). Moreover, transgression would have come from the north during the Early Kimmerian phase and, therefore, different palynomorph abundances would be expected. Other constituents of the shales have been addressed as well. The Rhaetian sediments of the subrosion pipe contained thin layers rich in coprolites and thin, non-pyritized layers with disarticulated fish remains (teeth, scales, and bones). These have not been found in the profile of Fig. 7 (Quarry IV). On the other hand, scales, teeth, bones, and coprolites have been found at Quarry IV, most likely originating from the thick pyrite layer 240 cm below the Rhaetian/Oligocene contact. Furthermore, small cubic pyrite crystals have been found in the subrosion pipe and in the lower part of the profile of Quarry IV. In conclusion, the question of whether the Rhaetian shales from the subrosion pipe and from Quarry IV are of the same age cannot be answered. Part of the British Rhaetian is the Penarth Group comprising (from old to young) the Westbury and Lilstock Formation, the latter including the Cotham and Langport Member (Warrington et al. 1980). The Penarth Group is primarily exposed in an elongated region across Great Britain starting near Bristol and further continuing in a NNE direction (Swift and Martill 1999: Fig. 1). The present geographic distance to Winterswijk is about 600 km. The Westbury Formation, 4–10 m thick, and the Cotham Member, rarely exceeding a thickness of 8 m, are composed of shales that are roughly comparable to the shales of the subrosion pipe and Quarry IV in that both shales are composed of dark non-calcareous, clastic strata. The calcareous mudstone sediments of the Cotham Member are, however, slightly coarser grained and lighter in color compared to the shales at Winterswijk. The 0–8 m thick Langport Member consists of light-colored micrites and calcareous shales (Swift 1999a), which is different from to the shales at Winterswijk. The Dutch Rhaetian shales are, thus, best comparable to the shales from the Westbury Formation. Bone beds are especially prominent in the lower part and base of the Westbury Formation. These bone beds are variable in size and content, but some can be followed over 400 km in Great Britain according to Martill (1999). Several thin bone beds, including possible parts of a pyrite layer containing bones, were found in the subrosion pipe. The pyrite layer of the subrosion pipe contained bones, scales, coprolites, and teeth. Quarry IV yielded one, several-centimeters-thick, pyritized bone bed at 240 cm stratigraphically below the Rhaetian/Oligocene contact (Fig. 7). Vertebrate remains have yet to be found from the small pyrite layer 35 cm stratigraphically below the Rhaetian/Oligocene contact. Large vertebrate remains, which are scarce in the bone beds of the subrosion pipe (the largest bone has a length of about 3.0 cm), have not been found in higher strata of the Westbury Formation (Martill 1999). The pyrite layer of Quarry IV at 240 cm stratigraphically below the Rhaetian/Oligocene contact, however, did yield larger vertebrate remains. Sykes (1977) noted that the Rhaetian shales of Great Britain contained bones within accumulations of sand and silt. These also have been found in the Rhaetian sediments of the subrosion pipe, but not at Quarry IV so far. The presence of bone beds, however, might indicate that the Rhaetian shales could be correlated to the lower part of the Westbury Formation. The bivalve fauna resembles the British fauna closely, because all species found in the subrosion pipe and in the Rhaetian sediments of Quarry IV were also found in Great Britain (Table 4). Moreover, the common Rhaetian bivalve genera from Britain Chlamys, Isocyprina, Lyriomyophoria, Protocardia, Rhaetavicula, and Tutcheria (Ivimey–Cook et al. 1999) are often common at Winterswijk, with the exception of Chlamys sp. The latter taxon is mostly found in calcareous mudstones and in argillaceous limestones in Great Britain (Ivimey–Cook et al. 1999), a type of sediment that is absent at Winterswijk. The Rhaetian sediments of the subrosion pipe could be correlated to the entire Westbury Formation and the basal part of the Cotham Member based on bivalve ranges provided by Ivimey–Cook et al. (1999) and Wignall and Bond (2008). Three genera dominate the bedding planes, similar to parts of the British Westbury Formation (see Ivimey–Cook et al. 1999). The absence of the species Liostrea bristovi, ‘Gervillia’ ornata, Isocyprina depressum, Isocyprina germani, and Mytilus cloacinus at Winterswijk suggests a correlation to the upper part of the Westbury Formation. The Rhaetian shales from Quarry IV might be correlated to the upper Westbury Formation or basal Cotham Member based on the presence of a specimen of Modiolus hillanus from Quarry IV. In addition, the low bivalve diversity at Winterswijk suggests correlation to the upper Westbury Formation. Quantitative sporomorph data, in particular those of predominant taxa, are, in the present authors’ opinion, not suitable for longer-distance correlation as these predominances indicate specific environmental conditions. An example was recently mentioned by Bonis et al. (2008), who compared St. Audrie’s Bay (Somerset, England) data with Hochalpgraben (Austria). In both sections, the sporomorph associations below the first negative carbon isotope record showed a dominance of pollen, mainly Classopollis, and just after the initial shift a distinct increase of spores and a decrease of Classopollis. In Austria, however, the dominance of spores persists, while in St. Audrie’s Bay it is followed by a monotonous assemblage of Classopollis. The samples under investigation should be compared with those from the Westbury Formation based on the absence and presence of palynomorphs. Very recently, an update of the St. Audries Bay palynology, concerning mainly sporomorph evidence, was published (Warrington et al. 2008). Unfortunately, there is a major sampling gap which prevents detailed comparison of the sporomorphs from the subrosion pipe with those from the Westbury Formation. Warrington et al. (2008) in their compilation of first and last occurrences of selected palynomorphs indicated only two species for the Westbury Formation: (1) Granuloperculatipollis rudis with its top in level 0.31 m above the base of the formation and (2) Kraeuselisporites reissingeri at level 1.07 m above base. It should be mentioned that the latter species is very rare in the Westbury Formation, which is comparable to elsewhere in the Rhaetian of NW Europe. In conclusion, this species does not seem appropriate for detailed correlation. The first species, however, indicates that at least an equivalent of the lower part of the Westbury Formation is present in the subrosion pipe in the eastern Netherlands. However, as outlined above, the sampling gap in the St. Audrie’s Bay section does not allow correlation to higher levels of the Westbury Formation. Thus, correlation to the middle or upper part of the Westbury Formation cannot be excluded. 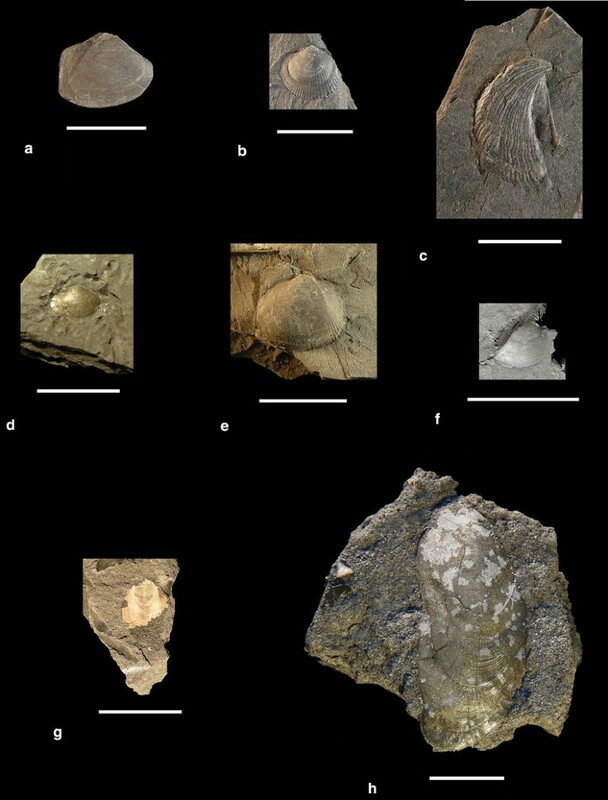 Several Rhaetian bivalves found in Austria (Tanner et al. 2004) were also found in the shales at Winterswijk (Table 4). The bivalve species Tutcheria cloacina, abundant at Winterswijk, was, however, absent in Austria. The notion that Austria and Winterswijk have fewer bivalve species in common as compared to Great Britain and Winterswijk has probably to do with the fact that the deposits in Great Britain and Winterswijk were formed in the same basin, the Anglo-Dutch Basin (Feist-Burkhardt et al. 2008: Fig. 13.25), in the Rhaetian, while the Austrian strata were formed in the small Eiberg Basin (Bonis et al. 2010), south of the Bohemian Massif, closer to the western part of the Tethys. The upper part of the Upper Triassic, which is represented by the Kössen Formation in Austria, is thought to be equivalent in time to the British Westbury Formation (Golebiowski 1990). The Kössen Formation (about 600 km from Winterswijk) comprises the Hochalm and Eiberg Member (Golebiowski 1990; Tomašových 2006). The presumed Norian/Rhaetian boundary can be found within the upper part of the Hochalm Member (Golebiowski 1990), although Bonis et al. (2010: Fig. 1b) showed that the entire Hochalm Member would be Rhaetian in age. The end of the Rhaetian is thought to be equivalent to the end of the Choristoceras marshi ammonite zone, a zone comprising most of the Eiberg Member (Golebiowski 1990; Tanner et al. 2004; Tomašových 2006). The bivalves Protocardia rhaetica and Rhaetavicula contorta are found in the Rhabdoceras suessi ammonite zone which is stratigraphically below the Choristoceras marshi zone based on the bivalve ranges provided by Tanner et al. (2004: Fig. 3). This suggests that the Rhaetian deposits from the Winterswijk quarry complex cannot be correlated to the topmost Rhaetian of Austria. Instead, a middle Rhaetian age is favored because the Rhabdoceras suessi is not considered to be equivalent to the uppermost Rhaetian. Within the framework of the search for, and defining the Global Stratotype Section and Point (GSSP) for the base Jurassic System (Triassic/Jurassic boundary), and the Lower Jurassic Series and Hettangian Stage, Kürschner and his collaborators at the LPP (Utrecht University) paid much attention to various exposures in Austria and adjacent South Germany (Bonis et al. 2006; Kürschner et al. 2007). Moreover, Von Hillebrandt et al. (2007) presented a compilation of data dealing with the candidate-GSSP Kuhjoch section, Karwendel Mountains, Austria. Important conclusions based on the palynomorphs are: (1) The typical Rhaetian marker Rhaetipollis germanicus has its last occurrence about 5 m below the proposed T/J-boundary, (2) the last occurrence of Ovalipollis pseudoalatus is ~3.5 m below it and (3) these studies are apparently dealing with a somewhat younger part of the Rhaetian than found in the Dutch Achterhoek area. An up-to-date, detailed study of the German ‘Rhaetian’ (strata younger than the Norian Steinmergelkeuper and older than Lias α) is not available. Nevertheless, the palynostratigraphic investigation of Schulz (1967), mainly dealing with wells and some exposures, is still significant, although it is restricted to the so-called Mittelr(h)ät to Toarcian, and some Steinmergelkeuper. Additional information on this is available from Achilles (1981) and Brenner (1986). A major conclusion is that several species as mentioned above appear spasmodic in the Mittelr(h)ät and become frequent in the Oberr(h)ät. In conclusion, correlation to Great Britain, Austria, and Germany suggests that only a part of the Rhaetian is present at Winterswijk. Bivalve and palynological results suggest that the Dutch Rhaetian sediments most likely were deposited during the middle Rhaetian. This is in line with the notion in Feist-Burkhardt et al. (2008: p. 781) that the most pronounced transgression occurred in the middle Rhaetian indicated by a marine fauna. The Rhaetian in Europe is characterized by an extinction of the marine benthos that contributed to the Triassic/Jurassic extinction event (Kiessling et al. 2007). The most severe extinction was found at the top of the British Westbury Formation, where 15 out of 26 species went extinct. Twelve out of 26 infaunal species from the Westbury Formation failed to survive into the Jurassic (Wignall and Bond 2008). At generic level, extinction rates were higher in southern Europe (Hallam 2002; Wignall and Bond 2008). Even prior to this dramatic extinction event, environments may have been already stressed. This is suggested by the low number of bivalve species at Winterswijk (eight in total). Bambach (1977) pointed out that on average 7–8 marine invertebrates species existed in stressed Mesozoic environments. Not only the bivalves suggest a stressed regime. Crinoid remains are absent from Dutch Rhaetian sediments, indicating shallow conditions or low oxygen levels near the bottom (Swift 1999b). Also, the palynodebris of the subrosion pipe is indicative of dysaerobic bottom conditions based on the conversion to SOM. The upper part of the bottom profile and bottom waters were most likely not anoxic because of the high number of bivalves and the presence of tiny burrows. The bivalve Rhaetavicula contorta is suggested to have been epifaunal, while Isocyprina, Lyriomyophoria postera, and Protocardia rhaetica might have been shallow infaunal burrowers (Ivimey–Cook et al. 1999). The relatively high number of articulated valves of Tutcheria cloacina suggest that it was an infaunal burrower because articulated shells are more likely to be preserved if a bivalve lives infaunally. Hence, at least some oxygen was probably present in the bottom. Other marine organisms do suggest a stressed environment caused by changing or low salinity levels. In contrast to southern Europe, no cephalopods have been found in the Dutch Rhaetian bone beds and shales, and in the British Rhaetian bone beds (Martill 1999). Corals, sponges, bryozoans, and brachiopods are also absent from the Dutch Rhaetian shales, as well as echinoderms, except for a small population of brittle stars (Thuy et al. 2008). 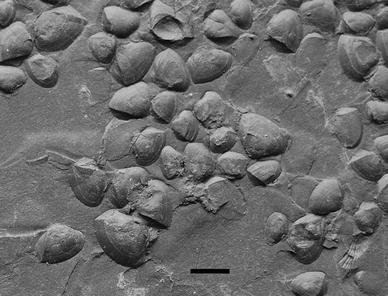 Echinoderms have been found in the British Westbury Formation, but only in low numbers. On the other hand, instead of changes in the salinity, muddy bottom waters might have hampered the existence of these organisms. The filter-feeding bivalves, however, are numerous and survived. The absence of the other groups of animals mentioned above, which are predominantly marine and cannot withstand changing salinity levels, strongly suggests that salinity levels might have fluctuated. A similar hypothesis was postulated by Schmitz et al. (1991), who studied 87S/86S ratios found in phosphates of the fish Saurichthys acuminatus from the bone beds of the Westbury Formation. Their results showed significant differences compared to the expected ratios for the Rhaetian seawaters. They suggested that the bone beds might be either reworked or freshwater deposits. Hallam and El Shaarawy (1982) also suggested that the salinity crisis in the Alpine region might have been present in northwestern Europe as well during the Rhaetian. The predominant palynological associations of this study are indicative of a near-coastal environment with definite marine influences. The low percentage (<5%) of the marine elements (mainly the dinoflagellate Rhaetogonyaulax) corroborates this interpretation. The marine fauna and flora of the British Westbury Formation lived in a shallow, storm-dominated marine shelf (Macquaker 1999). Judgments about water depth remain uncertain, as SOM may occur in very different sedimentary settings such as a stratified, even shallow, water column and below wave base. Feist-Burkhardt et al. (2008: p. 781) suggested that the large marine transgression during the middle Rhaetian commenced in the west near Great Britain. Thus, the sediments might have been deposited in a shallower environment in the eastern part of the basin, which might explain the slightly different interpretations for the paleoenvironments of the Rhaetian shales of Great Britain and Winterswijk. Unfortunately, the upper 5–7 m of the subrosion pipe was lost due to excavation (Oosterink et al. 2005, 2006). Nonetheless, the thicknesses of Rhaetian and Hettangian sediments can be estimated. Borehole ‘Ratum’, less than three km to the northeast of the quarry, yielded Rhaetian sediments with a thickness of 10.9 m based on, for example, the presence of Rhaetavicula contorta (Gerth 1955; Herngreen and De Boer 1974), while borehole ‘J’, even closer to the quarry, yielded 5 m of Rhaetian sediments based on palynomorphs (Herngreen and De Boer 1974). The latter was, however, the lowermost part of the borehole, suggesting that the total thickness was more than 5 m. Herngreen et al. (2000b) mentioned borehole ‘Sikkink’, less than 10 km west of the quarry, to contain Rhaetian sediments based on dinoflagellate and sporomorph content. Its thickness is only 30 cm (Rijks Geologische Dienst/Geological Survey of the Netherlands Report 2149, 1980). At ‘Grenspaal 94’ the Rhaetian was only 20 cm thick, while borehole Ratum ‘41F-129’ yielded 80 cm of upper Rhaetian sediments (Rijks Geologische Dienst/Geological Survey of the Netherlands Report 2297, 1995). Both are located about 1 km from the quarry. The thickness of the Rhaetian shales at Quarry IV (~4 m) also indicates a limited total thickness of the Rhaetian shales in the subrosion pipe. It is, thus, likely that the lost upper 5–7 m of the subrosion pipe did not consist solely of Rhaetian shales. This is corroborated by Hettangian ammonites that were found intermixed with the lowermost part of the Rhaetian shales in the subrosion pipe (Klompmaker and Van den Berkmortel 2007). 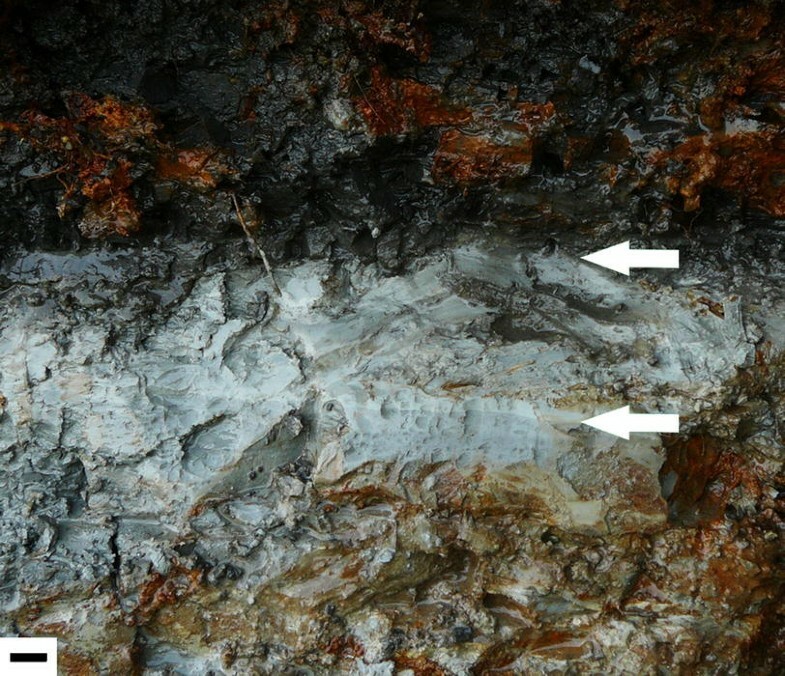 They hypothesized that meters of Hettangian sediments might have been present in the subrosion pipe before excavation based on the thicknesses of Hettangian sediments found in cores from boreholes in the close proximity. Unfortunately, it cannot be determined if Hettangian sediments were topped by younger strata. Oosterink et al. (2005, 2006) stated that the subrosion pipe could not have formed after the Quaternary because of the absence of a depression before the excavation of Quarry III. Ice ages would have leveled the sink hole by means of sediment displacement and cryoturbation. The authors suggested that the collapse took place after the tilting of the Anisian strata, which dip ~10° north. This is because the strata at the southern edge of the pipe were dragged down, while the strata at the northern edge were not. Furthermore, Oosterink et al. (2006) suggested that the pipe collapsed well after the Oligocene because Oligocene sediments in the neighborhood of the quarry are tilted, while Quaternary strata are not. This is based on the observation that the pipe would be vertical (Th. Simon, pers. comm., 2008). Further, Simon (pers. comm., 2008) mentioned that leaching requires low mineralized groundwater and is relatively fast on geological time scales. 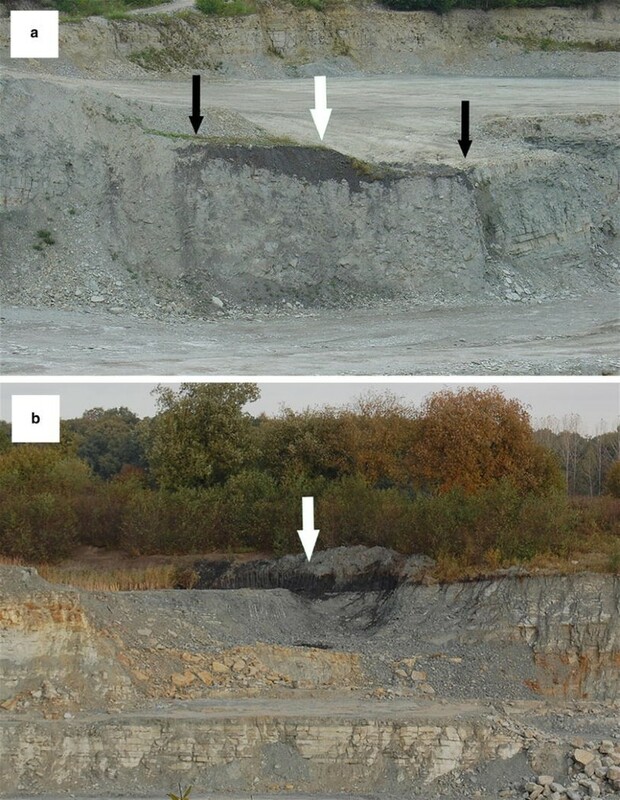 Therefore, the Röt in the subsurface of the Winterswijk quarry might have leached after any marine deposits because at that time low mineralized groundwater might be present because of terrestrial conditions. Hence, this water could have dissolved the Röt gypsum/anhydrites faster than seawater. This is because freshwater can dissolve more minerals generally. Moreover, while groundwater flow in marine settings is slow far away from the coast, groundwaters in near-coastal and terrestrial settings might dissolve the Röt evaporite because they might flow faster (Th. Simon, pers. comm., 2008). The latter suggestion, however, implies that marine conditions prevailed from the end of the main tilting of the strata (Late Cretaceous) past the time that the Oligocene sediments were deposited at Quarry IV. The Winterswijk area was, however, above sea level prior to the early Oligocene (M. van den Bosch, pers. comm., 2008) due to the Pyrenic phase. In addition, Oosterink (1986) suggested that the Winterswijk area might be continental during Late Cretaceous times. It, thus, appears that last argument provided by Oosterink et al. (2006) as mentioned above can be considered to be ambiguous. The argument that involves the dip of the Oligocene and Quaternary strata, and the vertical position of subrosion pipe, can be challenged as well. The dip of Oligocene strata is lower than the dip of the Anisian and Rhaetian strata at Quarry IV (M. van den Bosch, pers. comm., 2008). The Anisian layers have a dip of 9–16° N, while the Rhaetian shales at Quarry IV dip 20.7° N on average as based on 18 measurements. The Oligocene strata were discordantly deposited on the Rhaetian strata and the dip is likely from 0–9°. Indeed, Van den Bosch and Brouwer (2009: Fig. 4) showed that the dip of the Oligocene is significantly lower than the Anisian and Rhaetian strata north of the quarry. A dip of a couple of degrees is not likely to be observed from the edges of the subrosion pipe. This is corroborated a figure of the subrosion pipe (Oosterink et al. 2006: Fig. 2) which shows no clear vertical edge. Moreover, the distinct Anisian/Rhaetian contact does dip towards the north (Oosterink et al. 2006: Fig. 2), which suggests that the subrosion pipe could be slightly tilted. The collapse into the pipe, however, might have caused the northward dip. On the other hand, on the whole southern part, the contact appears to be tilted to the north, while the northern part is horizontal. The tilting hypothesis might, therefore, be considered more likely. This strengthens the hypothesis that the subrosion pipe was formed prior to the Oligocene. The Hettangian ammonites from the subrosion pipe (Klompmaker and Van den Berkmortel 2007) provide strong evidence against the formation of the subrosion pipe after the deposition of Oligocene sediments at Quarry IV. The Hettangian sediments certainly would have been removed by the erosional phase that removed the sediments on top of the Rhaetian at Quarry IV if the subrosion pipe formed after the deposition of the Oligocene. This is, however, not the case. Moreover, Hettangian sediments would be expected to be found more likely at Quarry IV than in the more southerly located subrosion pipe because of the generally north-dipping strata at the Winterswijk quarry complex. So, it is likely that the subrosion pipe formed prior instead of after the deposition of the Oligocene strata. Another clue comes from dips in Eocene strata. Van den Bosch (1999) noted that the marine sediments of the Dongen Formation (Eocene), exhibiting a dip of ~10°, were disconcordantly overlain by younger, horizontally lying Eocene marine sediments, also from the Dongen Formation. The dip of ~10° strongly suggests that the subrosion pipe formed after the deposition of this part of the Dongen Formation. The Winterswijk area might have been above sea level in the Late Eocene because of the presence of this unconformity. Maarten van den Bosch (pers. comm., 2008) confirmed that the Winterswijk area was above sea level prior to the Early Oligocene. As a result, leaching could have taken place in middle part of the Eocene and, subsequently, caused the collapse of strata, thereby forming the subrosion pipe. We kindly thank the ‘Working Group Muschelkalk’ and the exploiting ‘Ankerpoort Company’ for permission to access and study the Rhaetian sediments at Quarry IV of the Winterswijk quarry complex. Constructive comments by Theo Simon and an anonymous person on an earlier draft helped to improve the manuscript. Dirk Munsterman and Roel Verreussel (both TNO Built Environment and Geosciences/Geological Survey of the Netherlands) are thanked for access to the photo equipment. We are grateful to Cristina Robins (Kent State University) for linguistic improvements. Maarten van den Bosch provided useful information. Tony Hallam (University of Birmingham) is thanked for helping with some taxonomic issues on bivalves. For various reasons, the following are thanked: Betsie Klompmaker, Edo Klompmaker, Lucy van der Heiden-Klompmaker, and Nationaal Natuurhistorisch Museum Naturalis (Leiden). The reviewer Elias Samankassou (University of Fribourg/Free University of Amsterdam) and the managing editor André Freiwald improved the manuscript substantially with their helpful comments.